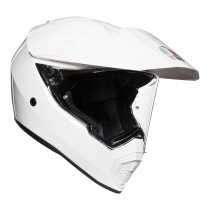 Lightness, comfort and adaptability reach the highest technological level in the AGV AX-9. It's superior modularity allows 4 different configurations, simply removing the redesigned peak and ultra-panoramic visor. 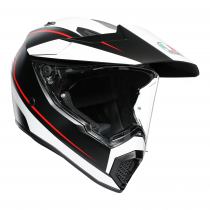 The lightweight construction of the Carbon-Aramid-Glass fibre shell provides AGV highest safety standards, while premium interiors are water resistant and extremely comfortable. 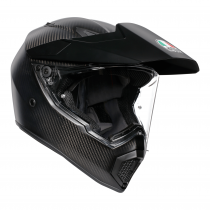 Aerodynamics and ventilation reach a new standard thanks to the new extractos and the new adjustable chinguard that can direct internal air flow to where the rider needs it. 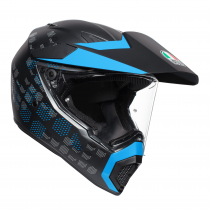 The Antarctica is a brand new colourway for a brand new helmet range. 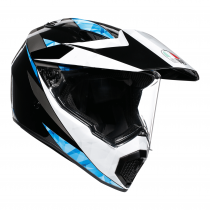 The AGV AX-9 motoryle helmet offers performance on and off road thanks to the adjustable ventilation system. Another fantstic feature is the Adjustable peak which offers more stability at higher speeds.